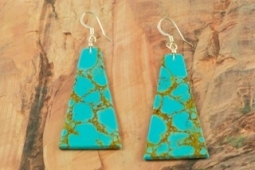 Beautiful Earrings featuring Genuine Turquoise with Sterling Silver French Wires. Created by Santo Domingo Artist Sheldon Crespin. Earrings are 1 3/4" L x 1" W.